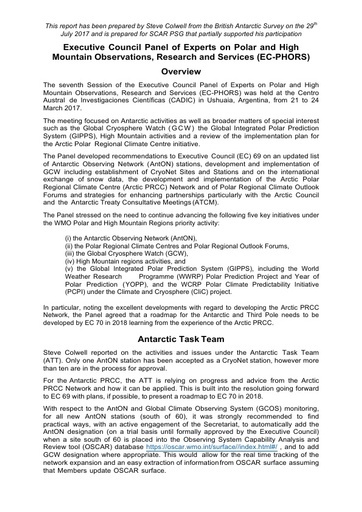 Report on the Executive Council Panel of Experts on Polar and High Mountain Observations, Research and Services (EC-PHORS) seventh session, held at the Centro Austral de Investigaciones Científicas (CADIC) in Ushuaia, Argentina, from 21 to 24 March 2017. The report was prepared by Steve Colwell (British Antarctic Survey) for the SCAR Physical Science Group, which partially supported his participation. The meeting focused on Antarctic activities as well as broader matters of special interest such as the Global Cryosphere Watch (GCW) the Global Integrated Polar Prediction System (GIPPS), High Mountain activities and a review of the implementation plan for the Arctic Polar Regional Climate Centre initiative.